Leah stayed in the same hotel as us on Sunday 29th August and Monday 30th August. 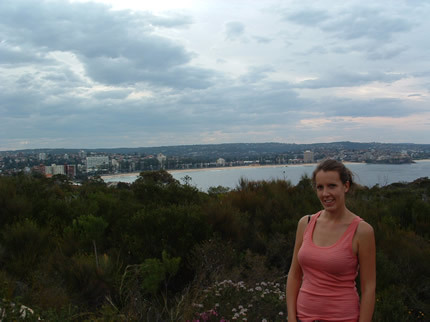 Leah had been to Sydney 10 years ago when she spent a year living in Brisbane, so she knew some of the places she wanted to see. 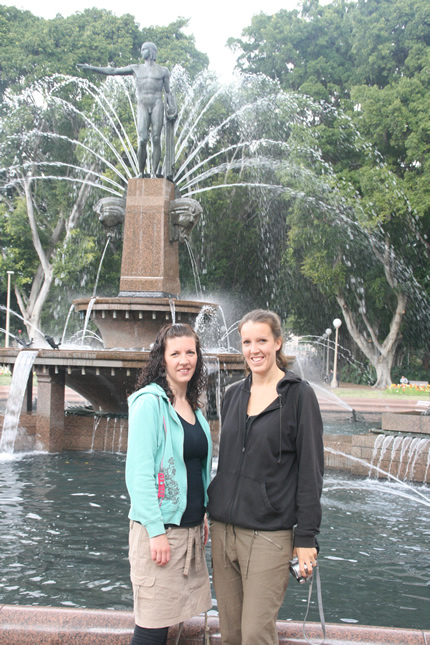 Also we had already spent a few days in the city, so we were able to also advise on a few places she may want to see. We started off the day with breakfast at Paul’s favourite place-Mc Donalds! Yes that’s right, even after all the wonderful food we have tasted all over the world, Paul still wants Mc Donalds…..and he is still craving a Kearne’s Sausage sandwich (he will have to wait till he’s at home in Ireland for that one). The first place we went to was Hyde Park. We looked around the gardens then took a look In the Cathedral. Then we walked over to the Domain Gardens and the Botanical Gardens. We took some photos in the botanical gardens, looking over to the opera house. Then we took a walk over to the opera house. 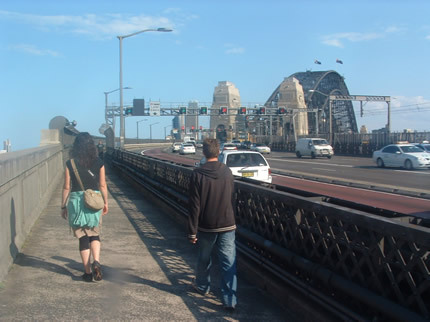 Then we walked over the Sydney Harbour bridge. We got a large chips to share for lunch on the other side of the bridge. Leah really enjoys taking photos, so she wanted to make the most of her last day to take photos in Australia, before leaving for Singapore. We went to Queen street Mall and looked around some shops. Leah was looking for shoes, but couldn’t find any. 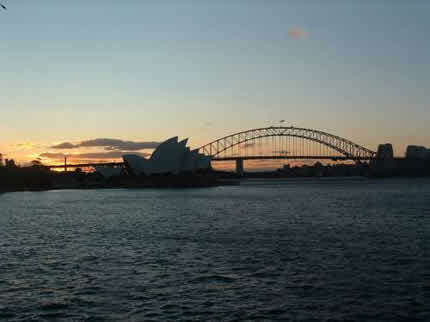 We went back to the botanical gardens to watch the sun setting over the Sydney Opera house. It was a beautiful sunset and Leah was able to get some good photos. To finish off the day we decided we should go out for Leah’s birthday which was coming up soon (13th September). 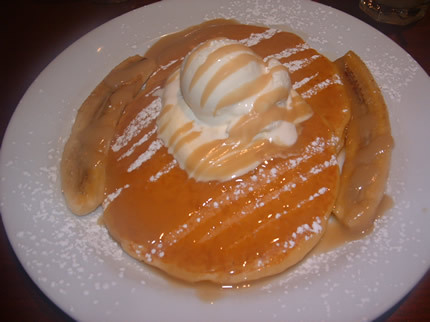 We took her out for dessert at a place called Pancakes on the Rocks. It was delicious, but extremely filling. 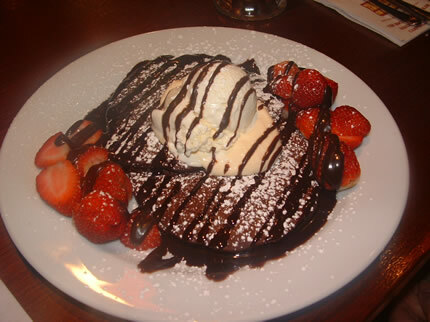 Here are some pictures to make you feel hungry. My sister Leah left today to go to Singapore. She got a shuttle bus from outside the hotel to the airport at 12.30pm. It was weird saying goodbye; we have got so used to Leah being with us. We had been travelling on our own for 6 months, but have spent the last 2 months with Leah. It has been nice catching up with Leah and sharing time with her in a country that she loves so much. 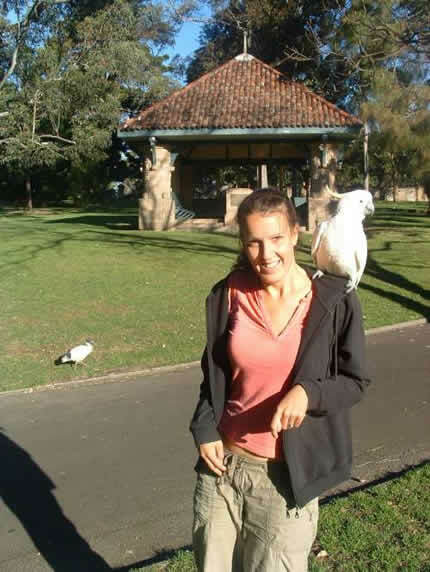 Leah lived in Australia for 1 year, 10 years ago and wanted to re-visit some of the places and people that she knew back then. 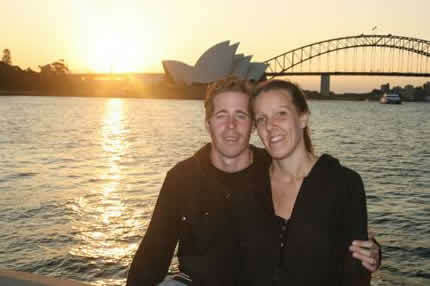 We have mostly been staying with friends of Leah’s in Australia. We have been looked after so well and will never be able to thank them enough. They will be more than welcome to stay in our future home, where ever that will be. Leah went on to Singapore and will be spending 2 weeks there. She is staying with a friend of hers, who now lives there. 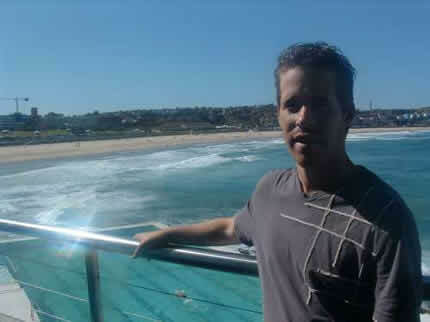 Wednesday 1st September We spent our last day in Sydney at Manly Bay. We got a ferry from Sydney Cover (by the opera house) to Manly Bay. The ferry cost us $14 (£8) each, for a return. The ferry took about 30 minutes to get there. 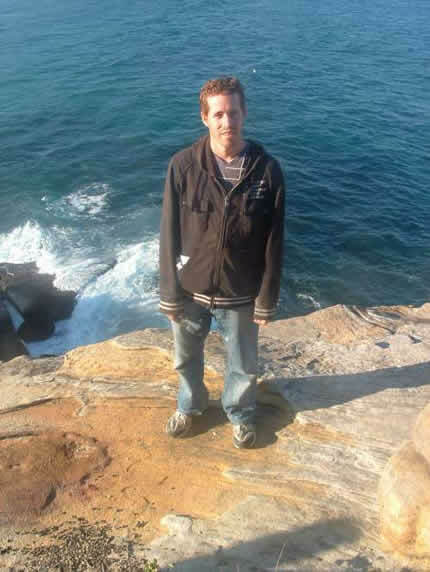 When we got to Manly bay, we took a walk along the beach. Then we went on a walk up along the cliffs. 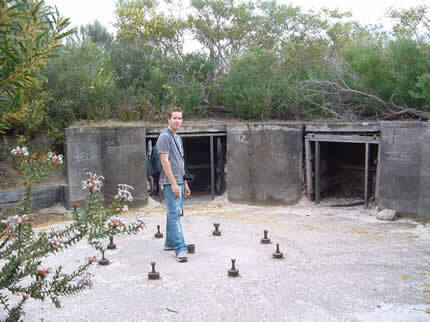 We came across an old defensive gun pit, from World War II. We were able to see some amazing views from the cliff tops. 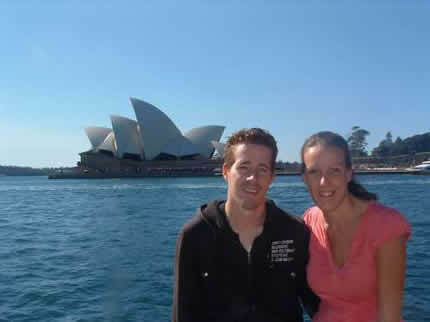 We really enjoyed our time in Sydney. It is a city I would like to revisit sometime in the future. We did so much in Sydney, that it would take me ages to write everything in detail, but here’s a list to fill you all in on some of the things we got up to. Maritime Museum on Darling Harbour-Part of the museum was free to view, so we took a quick look around and also we got to see some of the tall ships outside. Looked around Darling Harbour and the shops around Darling Harbour. Visited Wooloomooloo Bay-We took a walk down the pier and looked at all the Navy boats on the pier. Domain Park/Art gallery-The Domain park is connected to the botanical gardens. We went to visit the art gallery here. We passed by the State Libary, Parliment House, Sydney Mint Museum and the Barracks. In the evening we went to see Avatar at the Imax cinema. I preferred watching it this time round, on the big screen. There was meant to be an extra 8 minutes in the film, but I must admit I never noticed. Today we got a return on the train from Kings Cross to Bondi Junction, costing us $4.50 each (£3). 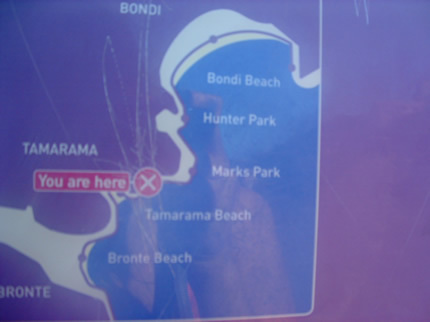 Bondi Junction is about 2km walk to Bondi Beach. 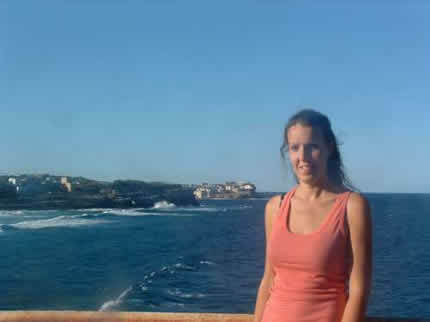 There was a beautiful coastal walk from Bronte Beach to Bondi Beach which we did. The views along the walk were stunning. We could see right down to the beaches and cliffs along the coast. 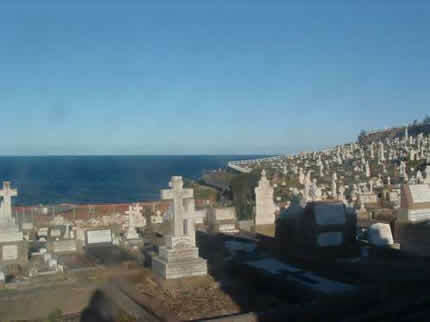 There was a massive grave yard that we passed by in Bronte, looking out to the sea. We noticed a lot of Italian names on the graves. We had a great day walking along the coast. The weather was perfect and the views were amazing! Saturday evening me and Paul walked down to Darling Harbour, to watch the fireworks. 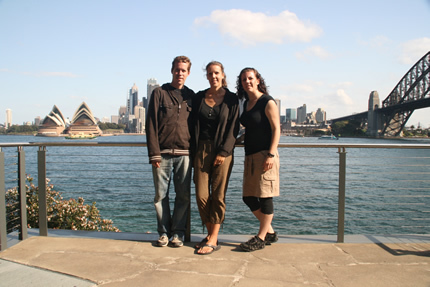 We also met up with my sister Leah Briefly before she set off on a ferry around the harbour. Leah arrived in Sydney on Friday afternoon and came to stay with us in our hotel from Sunday 29th August-Tuesday 31st August. We met up with Leah Sunday evening. After leah dropped her things of in the hotel on Sunday, we walked down to Darling Harbour to take a walk around. Then we went over to the Opera House and got Copenhagen Ice Cream…YUM Yum. I will write more soon about our day out with Leah and the rest of our time in Sydney. We flew with Jet Star from Melbourne to Sydney. The flight took 1 hour. When we arrived in Sydney airport we went to get our bags. We saw Paul’s bag coming around the belt, with the rain cover off and all the straps were un-done. My Chinese Instrument was rolling around loose on the belt. Unfortunately the mouth piece of the instrument got broken. We went to speak to a member of staff to find out why the bags straps were all un-done-but they had no explanation, and just said they could of got caught. I guess I’ll have to go back to China to buy another one of those instruments…..that was a disappointment, but never mind. We had a smooth arrival in Sydney. We got a train from the airport into the city. We knew of a few hostels in Kings Cross, so we just got the train to there. We got off at Kings Cross and checked into the Formulae 1 hotel. It cost $89 a night (£52). The room can sleep up to 4 people, for no extra cost. We knew my sister Leah was going to be staying with us for a few of the days, plus other rooms we looked at were more or the same price, so we went with this place. 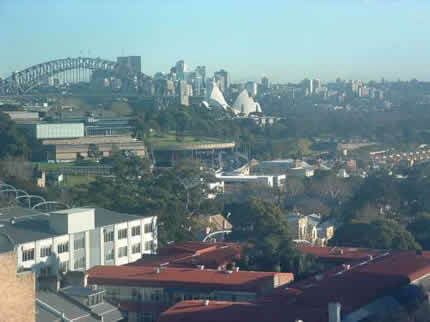 We could see the Opera house and Sydney Harbour Bridge from our room, which I was excited about. On our first night we went for a walk in to the city. We were just 10-15 minutes walk from the centre. We walked over to Darling Harbour. The harbour looks really nice at night time. There are loads of restaurants and shops around the harbour. There is also a massive IMAX cinema (The biggest screen in the world). We went to watch Hubble 3D. This is a documentary about the Hubble Telescope in space. It looked amazing watching it on the big screen. We were up and out by 8.30am this morning. When we get to a new place, we are always excited about adventuring around. First of all we visited Hyde Park. 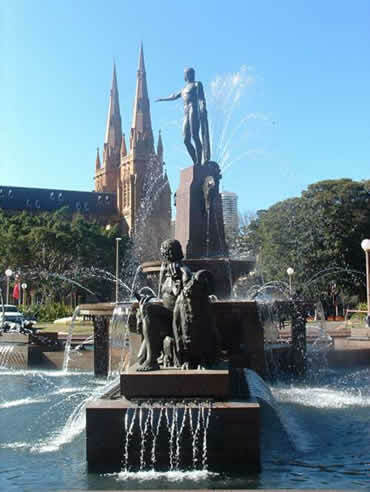 There is a beautiful fountain in the middle of the park, also St Mary’s Cathedral is found here. Next we headed over to Sydney Opera House. There was a Japanese Marching band playing, so we stopped to listen to them. After listening to the band, we took a walk around the harbour. 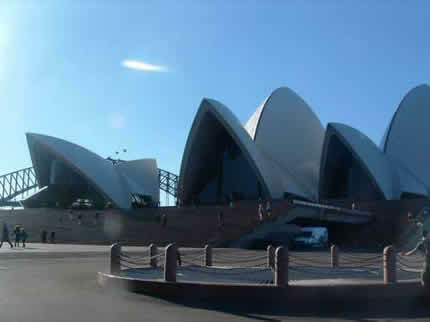 The Opera House looks amazing up close. I’ve always wanted to see the Opera House, so it was great finally getting to see it! We walked over to the Opera House. I didn’t realise the building was split into 3 pieces. 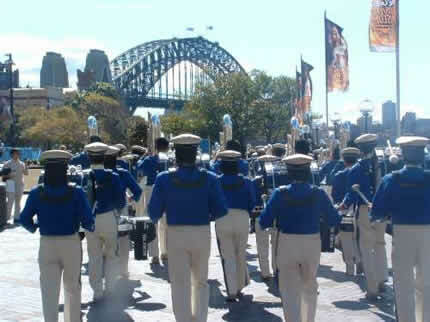 We then walked over to the Sydney Harbour Bridge. This is the largest steel arch bridge in the world, but not the longest. We decided to take a walk over the bridge. 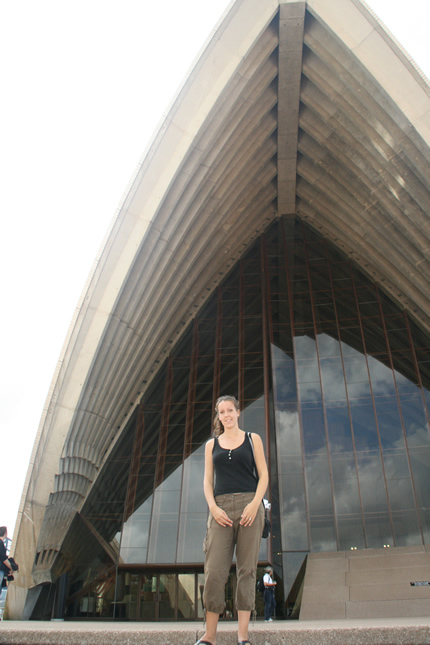 This was a great place to get the best views of the Opera House. After walking over the bridge from Sydney Cove (The opera house) you will end up in Kirribilli. 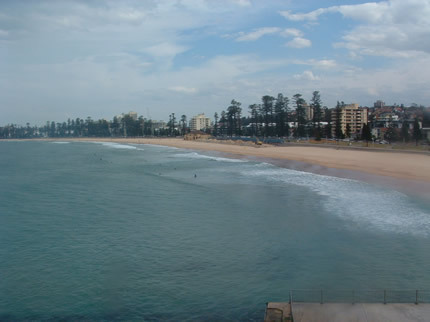 There is a short walk directly opposite the opera house, which gives you some great views. We stopped here and ate lunch. After lunch we walked back over the bridge and went to the Botanical Gardens. We have seen many botanical gardens around the world now, but I still never seem to get bored of them. 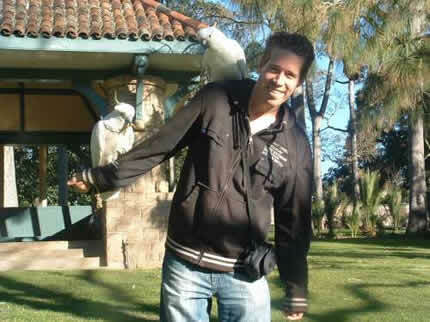 There were loads of Cockatoos in the gardens. They kept landing on us, I think they were trying to see if we had any food on us. When they started pecking my hand I decided to get some bread out so they didn’t eat me!! We decided we would watch the sunset from the park. We found a perfect spot, directly opposite the opera house, with the Bridge behind it. It was close by to Mrs Macqarius Chair-this is a chair that was carved out for Mrs Macqaries by her husband, it was her favourite spot in Sydney.